A Baghdad police station is the scene of the latest car bombing in Iraq. CNN's Rym Brahimi reports. (September 2). 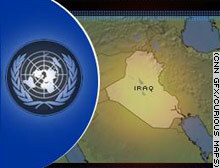 WASHINGTON (CNN) -- A U.S. resolution strengthening the United Nations' role in Iraq and calling for a broader multinational force in the country could be presented to the Security Council as early as Wednesday, White House officials have told CNN. The goal of the U.S. proposal is to draw more international involvement into the Iraqi post-war reconstruction effort, the officials say. "We have been saying we're working on a plan for more international participation, and that's what this is," one senior member of the Bush administration told CNN. Officials said President Bush signed off on the proposal for a new Security Council resolution Tuesday afternoon, following a meeting with Secretary of State Colin Powell. The administration's latest effort comes after four car bombings in one month have targeted those cooperating to at least some extent with the U.S.-backed Coalition Provisional Authority. Despite international outrage over the attack and concern at mounting instability in Iraq, several countries have expressed a reluctance to participate without the United Nations' blessing. One senior State Department official said the United States will circulate the proposal "within days" to the U.N. Security Council, but another administration official said the draft text could be introduced as early as Wednesday. "We have an approach we will talk with Security Council members about that is to facilitate and encourage the international community to provide even greater assistance to the Iraqi people to help build a better future for themselves," one official said. State Department spokesman Richard Boucher said Tuesday the Bush administration was "looking at language" for a Security Council resolution that would "elaborate the U.N.'s mandate, both political and the military point of view." According to an administration official, the council has reached consensus on the "building blocks" of the resolution. That would see the creation of a multinational force in Iraq under U.S. command and call for a greater U.N. role in the political reconstruction of the country, aiding in the drafting of a new constitution and moving toward national elections. Chris Patten, European Union foreign affairs commissioner, said, "There is a shared international interest in producing" after Saddam's fall "a peaceful, prosperous Iraq." "Of course, there were huge disagreements in the arguments of military intervention," Patten said. "There is no point at the moment on focusing on those disagreements."